“This is a ridiculous book,” Jon Kudelka firmly states with the opening sentence of the tome. He’s not wrong either. 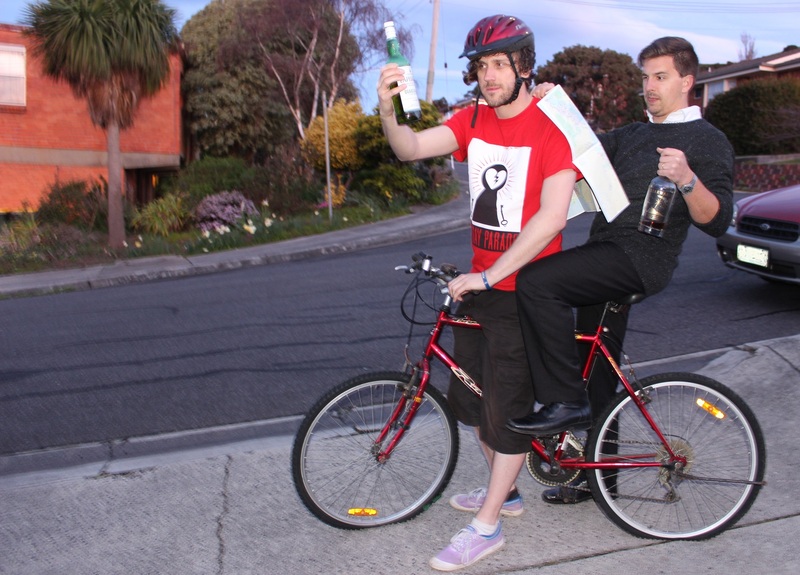 But when the story is about the odyssey undertaken by two cartoonists on electric pushbikes as they travel around Tasmania’s nine operating distilleries, what do you expect? 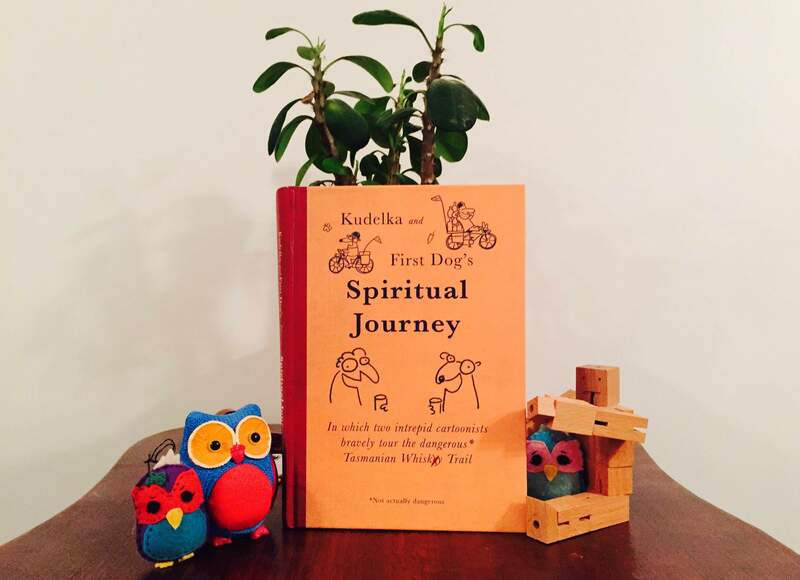 Kudelka and First Dog’s Spiritual Journey is a mad tale of discovery and comradeship, of long hill climbs and aching thighs, and of spotting local wildlife (or in Dog’s case, not spotting local wildlife). Firstly and foremostly however, it is a tale of whisky. The quest begins when two Walkley Award-winning cartoonists, Jon Kudelka and First Dog on the Moon decide they want to drink lots of Tasmanian whisky and get the internet to pay for it. One successful crowd-funding campaign later, the intrepid duo set off from Hobart on their electric bicycles, puncture repair kit at the ready. Kudelka and First Dog’s chosen mode of transport turns out to be perfect for drinking in the beautiful Tasmanian scenery as the duo meander between distilleries, although they also learn the hard way about what happens when your electric bike runs out of juice (and we’re not talking about whisky – that stuff flows freely). Over the course of two weeks they learn about whisky making from the horse’s mouth, spending quality time with industry greats such as Tim Duckett, Pete Bignell and Bill Lark, who personally cooks them a meal at his peat bog. As well as hanging out with the Tasmanian distilling pantheon, the boys also meet a lively cast of characters who variously offer them angry cheddar, yacht rides, stuffed foxes and advice on why you should always run over a Tasmanian Tiger if given the chance. As well as being a rollicking yarn, the book is also highly educational. With the aid of informative cartoon infographics, Kudelka and First Dog give some valuable advice on how to drink whisky: “Step 1: put a bit of whisky in a glass. Step 2: Drink it. The end.” First Dog also offers a lengthy discourse on his theory about why all goat based products, or indeed anything to do with goats full stop, should be avoided at all costs. This is life changing stuff people; take heed fellow wafflers. If you are interested in Tasmanian whisky, then this is the book for you. If you are interested in the drunken ramblings of two cartoonists, this is also the book for you. The hilarious anecdotes, friendly banter and whimsical illustrations are a truly laugh-out-loud combination. Either way, you should look it up. After all, it’s recommended by two out of two cartoonists surveyed. And two out of two whisky bloggers as well. Now that’s a cycling trip I’d like to do! Ah that mythical Tassie whisky trip – almost as good as an ACTUAL Tassie whisky trip! Ha ha, seriously though, sounds like a good plan – the book would make the plane ride over even more exciting!